We all know that entertaining can get a bit expensive at times. Especially when you add fresh flowers to the mix. Pre-made floral arrangements can be very expensive. One of the ways I try to save when I am entertaining, is by creating my own floral arrangement form supermarket flowers. It can save you a lot of money!! I usually grab a few pretty flowers from Trader Joe's or Whole Foods Market. I will use whatever flowers are in season which is usually priced for less. 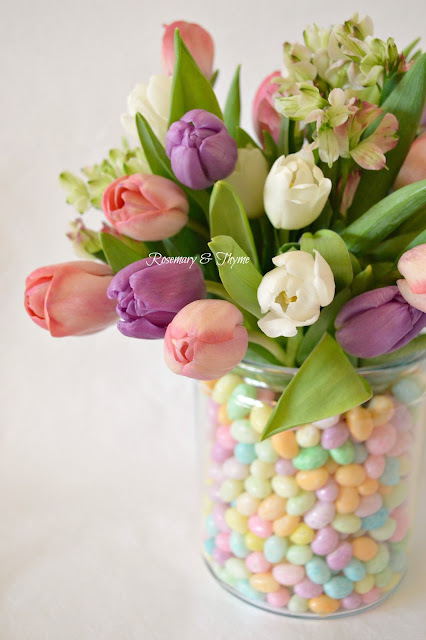 The tulips that I used for the Easter inspired arrangement in this project came from Whole Foods. Cost 10-Stem Tulip Bunches 3 for $12, added two bags of jelly beans at $0.99 cents and used glass containers that I already owned. So for about $14.00 I have a spectacular Easter/Spring Floral arrangement that could easily retail for $40 to $60 at a florist. Plus, I had a few stems left over that I used to decorate other rooms. And don't worry, it is so simple. See below for supplies and instructions on how to create one of your own. Place the small vase inside the larger one, and fill the space in between with jelly beans, making sure that the inner vase is centered. Fill the inner vase halfway with water. Prepare tulips by removing foliage from stems using a sharp knife or scissors. 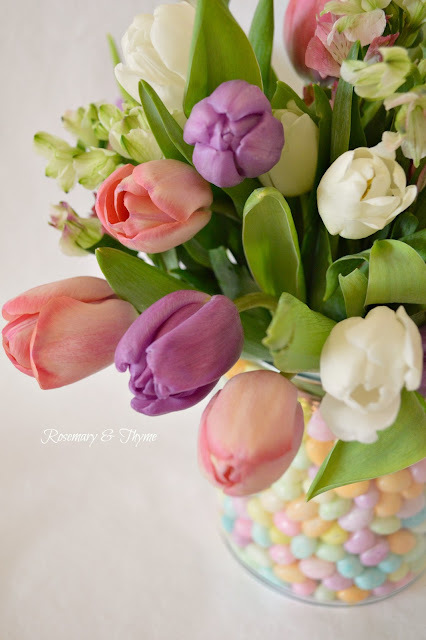 On a work surface, stack tulips so that the flowers and stems are aligned, alternating flower colors as desired. Cut stems to a uniform length using a sharp knife or scissors (you can determine the height of the flowers visually). 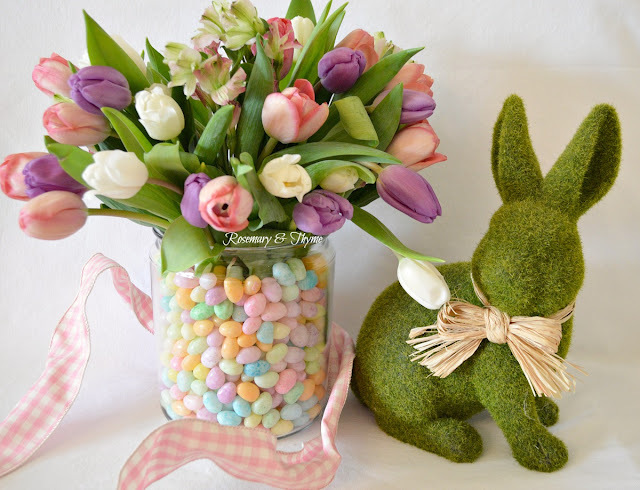 Fill inner vase with water, and add flower food, following label instructions. Place flowers in inner vase. Be sure to choose two containers that fit inside of one another - mine are an old vase and medium glass canister I already had. 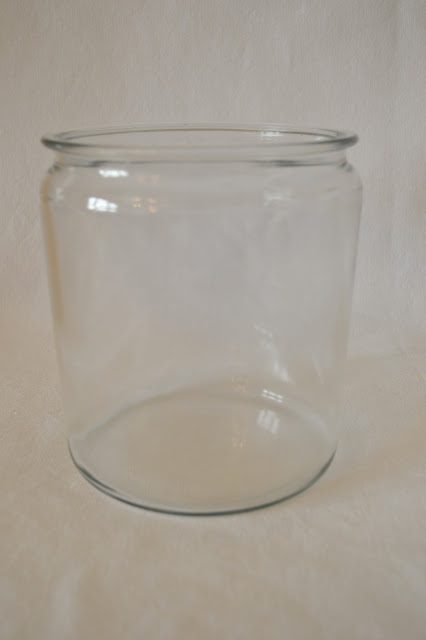 Fill the smaller container with water. Then add jellybeans around the outside, jiggling the inside cup to make sure the beans are all the way down the sides. Be sure to choose an inner container that leaves you with enough room to fit the beans. 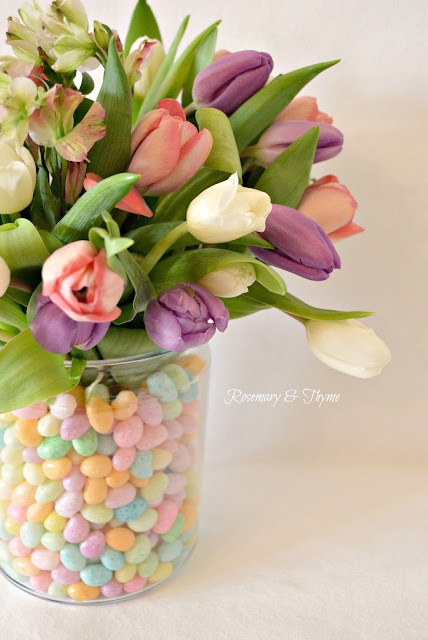 Arrange the flowers the way you want, then carefully add water then carefully add water without spilling on the beans. I am so happy with the way the arrangement turned out. So so pretty!! I love the bright colors of the tulips and jellybeans. This centerpiece would look wonderful on any table. This would also make a great and inexpensive hostess gift. Thank you for stopping by today. I hope you all have a great week. Thank you Louca. It is my pleasure. Looks beautiful and what a great arrangement. Thanks for the DIY on making this. I hope all is week by you. Thank you for taking the time to visit me and for leaving your sweet comment. It is my pleasure to share ideas that you all can use. Happy Spring!! 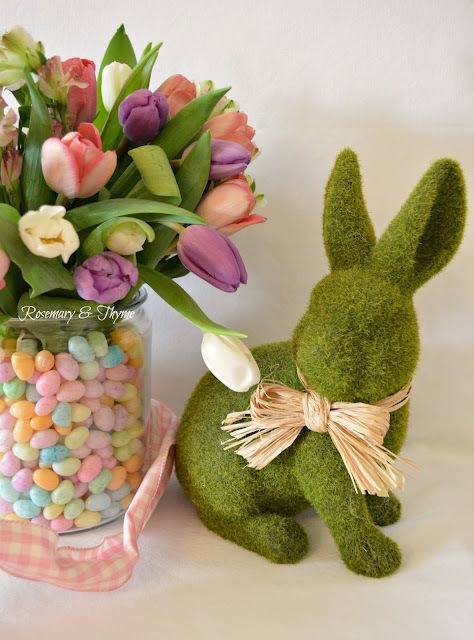 I am glad you like my floral arrangement tutorial. You will very happy with the results. Thank you for visiting me and leaving me your sweet comment. Maybe I can use pastel color candy, I love it ! Which party, or when was it featured darling? I been away so I haven't been around my computer, I even have a cousin from NYC at home as a guest. Busy life! Dear friend, thank you so much for your sweet comment. You sure make my day ! Que pena que donde vives no hay Jellybeans. What a disappointment. You can try any version of this arrangement. The possibilites are endless my friend. You have been very busy the last few months but it is wonderful to be enjoying the company of family and friends. I am glad you liked my floral arrangement tutorial. I am glad you liked my floral arrangement tutorial. You will very happy with the results. A fabulous idea Janet. It looks so nice thank you for sharing it. Hope all is well with love Janice Happy Spring. I am so happy you came to visit and glad to know that you enjoyed my floral arrangement tutorial. Everything is going great. Just extremely busy with a few home projects. I hope all is well by tyou also. A tasty treat and beautiful centerpiece all rolled into one, I love it!Thank you for sharing with us this week at Celebrate Your Story, and I hope you’re having a great weekend. I love the colors in your centerpiece! I am glad you liked my floral arrangement. That is perfect! Thank you for sharing at Home Sweet Home! I am glad you liked my floral arrangement tutorial. I hope you give this a try. You will very happy with the results. Thanks for joining Cooking and Crafting with J & J! Hi Janet, I love your pretty arrangement! Thanks for sharing this at C&C with J&J. Love everything about this gorgeous centrepiece Janet. The pastel coloured jelly beans have won my heart! I'm so glad you shared this project at Create, Bake, Grow and Gather this week and I'm delighted to be featuring it at today's party. It gives us immense pleasure to introduce ourself and our travel hub one of the premier travel hubs in the state of Jammu Kashmir. Click on the image to view online version of issue. ~ My little old world ~ gardening, home, poetry and everything romantic that makes us dream.